With its immense beauty, St. Lucia is a romantic Caribbean island with majestic rock formations and lush tropical forests. Traditional towns are scattered throughout the landscape, and you will be able to stroll and explore the charming streets and historical monuments which reference St. Lucia’s past. Enjoy a moment of relaxation on the golden stretch of sand, surround with crystal clear water. Sampling the fine gourmet food in local restaurants is the perfect way to spend an evening. Make sure to taste delicious Creole specialties such as Colombo or freshly braised fish. Generally speaking, Saint Lucia’s medical system is far from satisfactory. Facilities offered include the government-run Victoria Hospital and Soufriere Hospital as well as a travel health clinic. You can buy medications from these hospitals, or from one of the pharmacies on the island which are well stocked with quality drugs. However, ensure to keep prescribed medicine and a first aid kit with you at all times. Dial 911 for medical assistance. Is Saint Lucia Safe for Travel? Do I Need a Visa to Visit Saint Lucia? 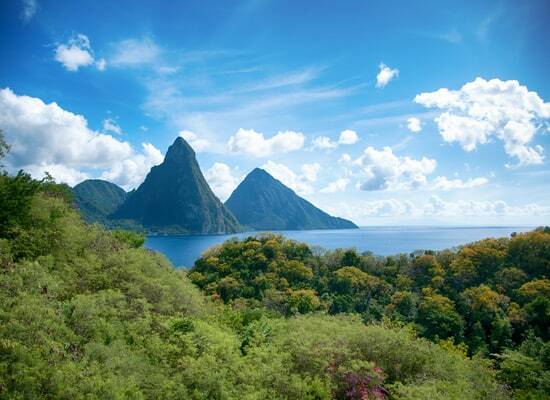 Only a passport is required to enter Saint Lucia for trips under 42 days. The passport must be valid for at least three months beyond the date of departure. Please note that this is the website for the Canadian High Commission in Barbados. There is no Canadian government office in Saint Lucia.